Prada's Miu Miu brand recently launched Miu Miu L’Eau Rosée, a flanker to 2015's Miu Miu. 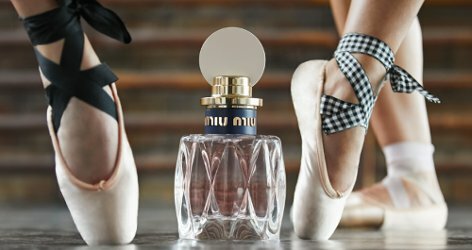 Like its predecessor, this is a scent designed to express "the spirit of the Miu Miu girl," packaged in the same "matelassé bottle" design (with new colors) and developed by the same perfumer, Daniela Andrier. To begin: L'Eau Rosée is not a rose perfume. The name refers to the pink tint of the liquid inside that ridiculously chic bottle, just as L'Eau Bleue was literally blue. L'Eau Rosée is described as a composition of "lily of the valley and cassis buds...tightly wrapped in notes of sophisticated musk," with additional notes of gardenia, bergamot, tuberose, jasmine, white pepper, honeysuckle, ginger and cedar. L'Eau Rosée begins on a sweet-tart blackcurrant note, but it's not a fruity fragrance, overall; even that fleeting cassis introduction feels a little muted by some shampooey white-petal notes. As the fragrance warms and softens, there's a brief phase that feels weirdly 1980s — I think it might remind me of some white florals of my distant past, like Anaïs Anaïs or Le Jardin de Max Factor — but the rest of the fragrance feels very present-day. Its core is a clean, peppery lily-of-the-valley enshrouded and trailed by a sheer layer of aldehydic white musk that makes me think of Chanel No. 5 L'Eau (which I really like, incidentally), minus the crisp edges. I wasn't a big fan of the first Miu Miu fragrance: it was a bit too "green" and nose-scratchy for me. L'Eau Rosée, as a "playful soft floral," is more to my taste and seems to meld more easily with my skin. It also has excellent tenacity, lasting through most of the workday. If it's not ground-breaking, at least it's not doused in sugary fruits or vanilla, like so many fragrances aimed at younger women seem to be. And if it doesn't completely capture the Miu Miu aesthetic, well, it's a lot more affordable than those Miu Miu ballet slippers with buckled leather straps and gingham ribbon ties that I've been admiring online. I laughed when I read Robin's justification for her recent impulse purchase of Atelier Cologne Iris Rebelle, because I went through a very similar process when I bought L'Eau Rosée. Here's my version: it's winter, I'm stressed, it smelled good, the bottle is adorable, the price is reasonable, and there's a kitten in the ad. There you go. I really didn't need a new perfume, but I'll probably wear it to work regularly this spring. Miu Miu L’Eau Rosée is available in 10 ($28), 30 ($61), 50 ($81) and 100 ml ($105) Eau de Toilette. I got the cute mini of this. It’s pleasant and easy to wear. A nice winter pick me up! Hurrah for 10 ml bottles! May all houses offer them in the future! Yes indeed! Purse sprays and roll-ons and tiny bottles are the best! This sounds really pleasant. Hopefully Sephora will get it in the stores. Right now, it’s online only. I do love the kitten!! I loved the black-and-white feline “model” in the first Miu Miu fragrance ads, and this little tiger is pretty cute, too. Exactly…we can all use a few light-hearted fragrances for spring…no need to break boundaries (or glass) every time! I have a mini of the original Miu Miu. I freely admit that I bought it for the bottle which sits on a mirrored tray on my dresser. This new bottle is pretty too. The bottles are just as good in person as they are in the photos, which isn’t always the case! They’re perfect for display. I bought an empty bottle of the original Miu Miu on eBay purely for display for only a couple of ££. bargain! Got a “sample” (one of those card-things, not a real sample) of this with my Sephora order today. I do love lotv, and I am a sucker for a 10ml bottle, so maybe this will be my first Prada scent . . .
It’s a purse-size spray, so it’s not quite as pretty…but it’s a great deal! !